The first thing I should mention about eating food in Cuba is that you’re probably going to get sick. Is that a bad way to start this topic? Well, too bad. It’s true. It’s not that the food in Cuba is unhealthy; somehow not up to the specs of food in the U.S. Rather, it’s that whenever you cross country boundaries, you’re likely to run into food with different bacterial contents. Those bacteria are not necessarily bad for you, they’re just different from what your stomach is used to. After a couple days of… shall we say, gastronomical distress, you’ll adjust and be good as new. Okay, great. Let’s focus less on stomachs and more on what goes into them. The food in Cuba is wonderful, if not terribly unique. What I mean is that a phrase like “Cuban food” will probably not spark specific images like “Mexican food” will – at least it doesn’t for me. What is traditional Cuban food? Chicken, Pork, Fish. Yucca, potatoes, and malanga. Fried bananas. Black beans and rice. Lots of fruit. Tiny, super-strong coffees. Nothing really stands out, does it? I guess what makes Cuban food unique isn’t so much the foods themselves, it’s more in how they’re prepared and how you get them. For one thing, it’s often quite hard to find a street vendor in Cuba. I’m not sure, but I have a hunch that you can owe that to communism. Think about it: In other Latin American countries, all you need is a cart and some food and you can usually set up shop on just about any street corner. But in Cuba, you’re not allowed to own the cart, let alone become an entrepreneur. Without the government’s say-so, you can’t quit your day job and start selling food. So, it may not be so easy for the average tourist to find food in Cuba, but you’ll just have to trust me when I tell you that it’s worth the trouble. Each place is different, though, and the food will vary in price, quantity, and, of course, sabor. In relation to the total amount of time I’ve spent in Cuba, I haven’t passed very much of it in Havana. In the six or so days I’ve been there looking for places to eat, though, I have gathered a few tips worth sharing. First, is the Restaurante Hanoi in Old Havana. While just a couple blocks from the touristy Captiolio, the prices are quite inexpensive. Order one of their “value meals” (my words, not theirs) for about $2.50 to $3.50 a plate. If that’s not enough to fill you up, there are a couple dozen side orders under a dollar that you can add. Even with a drink, your whole meal should easily come to less than $5. Tipping the band might put you over, though. As for other places to eat in Havana, I don’t have much to offer. I’ve had decent (included) breakfasts in the Hotel Colina, ate a couple times at a small restaurant just down the street (it’s across from the Hotel Colina, about two blocks towards the cinema on the left – I want to say the name has something to do with small monkeys, but that may just be my memory playing tricks on me! ), and spent more money than I should have on snacks and sandwiches on the waterfront near the cathedral. If you can find out-of-the way places where Cubans eat, you’re more likely to find better deals. In the mornings, bakeries will have fresh-baked rolls for about 4 cents each, and establishments like the Angel de Tejadillo that cater to Cubans will have offerings like con gris (pork and rice plates) for less than a dollar. There are a couple restaurants, cafes, and at least one bakery in Viñales, but I think you’ll be better off eating at a Casa Particular. And really, unless you’re planning to stay about 3km out of town at the only hotel, that’s probably what you’ll be doing. Fish, Chicken, or Pork are the main dishes, but don’t be surprised if you’re offered lobster, too. Side dishes are plentiful – Viñales is prime farmland and I guarantee your table will be filled with more potatoes, yucca, fruit, beans and rice, fried bananas, and salad than you can eat. All that and a family atmosphere for $7 ($8 con cerveza) and Viñales easily adds up to the best dining experience in Cuba! As dinnertime approaches in Trinidad, the hustlers emerge from the crooked streets’ alleys and begin their quest to nourish the tourists. Compared to the other places where people tip-toe around the rules and regulations and haggle in hushed tones to avoid being overheard, Trinidad hustlers practically conduct open warfare for your dollars. As annoying as it is to be accosted and offered food at every corner, this kind of rampant competition gives you the opportunity to find a great deal. Chicken dinners can be had for as little as $3, vegetarian plates for less. Lobster is commonly offered for $8 or $9, but can be quickly haggled down to $5. Make sure to establish what the costs are going to be on the street before being led anywhere – 90% of the time the person offering to take you in for dinner is going to usher you to someone else’s house for a commission. By the time we got to Baracoa, we were starting to get the hang of eating in Cuba. New Year’s meant weeklong parties in the street and cheap pork sandwiches with, if you’re persistent in the hunt, tomato slices and lettuce. Peso ice cream stands could be sought out and street pizza venders weren’t too hard to find. We were even lucky enough to arrive during a market where, for the first time, we could buy fruit, vegetables, and rice all in the same place. It’s rather strange how Cuba doesn’t have consolidated markets like Mexico, Ecuador, and other places I’ve been. After a day or two, when the Baracoa market (which was situated along the Malecón) had been closed down, we asked a few people where we could buy some bananas. I was stunned to see locals put on a pensive look, shake their heads, and tell us that it was pretty much impossible. In Baracoa, at least, they simply don’t sell fruit outside of a weekly (monthly?) market. There must be a way for the locals to barter for it, though, because like many other places in Cuba, the best food was always found in the Casas Particulares. A breakfast negotiated at $2.50, at least at our place, would consist of coffee, fresh juice, mandarins, bananas, bread, and eggs. Dinner would have the typical offerings of beans and rice, salad, and your choice of meat. Baracoanos prepare a nice fish-in-coconut sauce that you should try at least once. Before you leave Baracoa, seek out the elusive cucurucho. 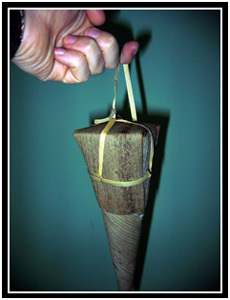 A cucurucho is a candy-like, coconut-fruit-nut paste, triangular thing ornately wrapped up in dried palm fronds. It’s almost like eating a natural, uncooked cookie dough. Mmmmm. We found them offered for sale from the shady park on the east end of the Malecón. If you can’t find them there, ask around. I hear it’s a Baracoa specialty, so it shouldn’t be too hard to find. There’s a big hotel on the corner of Plaza Céspedes, too, if you’re feeling touristy. Sandwiches run about $3, and an authentic Coca-Cola will add another $1.50 to your bill. The café on the bottom floor also serves pizzas and other lunchabes, while the hotel’s rooftop restaurant caters to the upper class traveler. Unfortunately, I wasn’t one so I can’t comment on the $10 breakfast buffet – but I can tell you that the view of the city and bay was quite nice from up there! For dinner (on one of the two evenings I was in Santiago,) I found myself on a little Mediterranean-looking island in the middle of the bay called Cayo Granma. Four of us had a pleasant meal on the roof of someone’s house where we could admire the sunset while listening to a couple guitar-players providing us with our own, low-key dinner music. If you make it out to the strangely named island, you’re sure to be hit up by dinner-hustlers, Trinidad-style, before you even get to the ferry. Choose your hustler carefully, as they’ll probably attach themselves to you for the remainder of the day. Also, if you wait until you get to the island before acknowledging them, I’m sure you’ll get a better price. In any of the cities listed above, there’s always the chance that you’ll get lucky and stumble across a fiesta. In that case, you can forget what I said above about a lack of street food! In Viñales and Baracoa there were literally thousands of pork sandwiches being sold for Carnaval and New Years. People wandered the streets selling cakes and there were lemonade-like set up for sugar-cane soda, coffee, and even shots of rum! Get really lucky you’ll find the beer-wagon that will refill any container you present to them with 16-cents-per-bottle beer – I’ll leave it to you to decide if drinking watered down, 16-cent beer is good luck or bad. Other culinary opportunities might present themselves… such as going to a baseball game! A respectable stadium like Havana’s might also be considered a fiesta and there’s no shortage of food. Hawkers will stop by often selling everything from tiny paper funnels filled with peso coffee to $2 beers. They have the ever-present 25-cent pork sandwiches, too, and oily butter cookies. Sadly, no hot dogs. Wherever you go in Cuba, you’re bound to find good food. Don’t be deterred by the fact that it doesn’t have the name recognition of Thai or Mexican food. Eating in Cuba was one of the things I looked forward to every day of my time there. I came across here looking for an example of Cuban street food and was delighted to find that an excellent story came along with it. Hey, thanks Nicholas. Glad you liked it!